A recently unearthed Rolling Stones track has been released as a limited edition 7" single for Record Store Day. 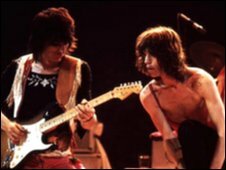 Plundered My Soul was recorded during sessions for the band's sprawling 1972 double album Exile On Main Street, but was left to languish in the vaults. The group rediscovered the track while preparing a reissue of the album, which is due to be released on 18 May. Just 1,000 copies were pressed for Record Store Day on 17 April, held to promote independent music stores. The Beatles, Pet Shop Boys and Goldfrapp also put out limited edition recordings in aid of the event, which is now in its fourth year. Spencer Hickman, who manages the Rough Trade East store in London, helped to co-ordinate the UK side of the event. He said there had been a huge surge of interest from customers and record companies. "Last year was great but this year's really firing," he told the NME. "It's got a bit easier, I haven't been going begging for releases, people have been going, 'We've got this unreleased Rolling Stones single, do you want it?' There's been such a wealth. " Britpop stars Blur also released exclusive new material in aid of Record Store Day. Fool's Day is the first song recorded by the band's original line-up since guitarist Graham Coxon quit in 2002. Only 1,000 copies of the record were made available in participating stores, making it an instant collector's item. Lead singer Damon Albarn said independently-owned record shops were "an important part of our musical culture". 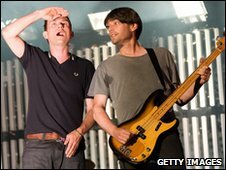 "Music is a simple way for Blur to show our support and I hope people like it," he said. Recent figures showed that there are now just 269 independent record shops in the UK - a third of the number there were five years ago. The Blur single is part of a series of limited editions released by Parlophone Records to support Record Store Day. The records, in vintage-style wrapping, will also include tracks by Bat For Lashes, Hot Chip, Babyshambles and Lily Allen. There will also be exclusive UK releases by The Flaming Lips, Jimi Hendrix, the Stone Roses and MGMT. Record shops across the UK will also be hosting in-store gigs by the likes of Ash, Laurie Anderson, The Paddingtons and Bombay Bicycle Club. In the US, where Record Store Day was conceived, there will be more than 200 separate releases. They include a reissue of REM's long out-of-print first EP on blue vinyl, a "surprise" new song from rap stalwarts The Beastie Boys, and two new tracks from Hole's upcoming album.